You know I am always preaching about doing backups. And even people that don’t have a backup process in place know that they SHOULD, but until that unexpected problem comes up and they lose their important documents or irreplaceable pictures, they just say that they’ll do that “someday”. Today I’m not going to tell you about all the files you SHOULD be backing up – instead I’ll tell you about a particular type of file that you should NOT back up. Question: What’s worse than having your computer crash when you have no backup? 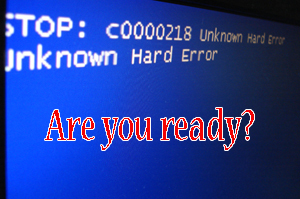 Answer: A computer crash when you THINK you have a backup, but you don’t. I’ve seen this happen a few times and it’s not good. Client calls me and says the computer won’t boot up, or it’s giving an error message like “Operating system not found” or “Boot device not found” or something similar. That almost always means a hard drive crash. So I go over and check the computer, and yep, it’s a hard drive crash. We replace the hard drive and get Windows and Office reinstalled, then it’s time to restore the recently-backed-up novel from the flash drive back to the computer. That’s when my heart sinks. Because I’m going to have to tell the client that this backup is not a backup. Do you see the telltale clue in that image? It’s the little arrow in the bottom left corner of the icon. That little arrow means what we’re looking at is not the actual Word file. Rather, it’s a shortcut to the main file. It just points to the main file. It’s really nothing more than an icon. It’s not the Word document. Really, it’s a pretty easy mistake to make. You have the actual important document saved in the Documents folder, where it should be. But you want quick, one-click access to it, so you make a shortcut to it on the desktop. The only file you ever click on to open it is that desktop shortcut. So it kind of follows logically that if you want to make sure you have that file backed up, you backup the file that’s on the desktop – the one you see all the time, and click on all the time. WRONG. If you are backing up just a single file to a flash drive, make sure the icon does not have that little arrow in the lower left corner. Have an online backup process in place – so even if you forget to back up an important file, it’s going to be backed up anyway. This is 100% automated. Don’t just back up a single file – back up the entire Documents folder (or whatever folders contain your important stuff).